I often get asked what can be done to increase the cycling rate in countries outside the Netherlands. It's often noted that there is little government or public enthusiasm for spending even small amounts of money on the small number of people who are currently cyclists. I think it's a good idea to look at what worked in the Netherlands. Cycling in the Netherlands declined sharply in the post-second world war period. In the 1950s and 1960s, existing cycle paths were in many cases removed in order to make space for more cars. "From 1950 to 1975, the bicycle was almost entirely excluded from the government's vision"(Dutch Bicycle Master Plan 1999). The number of deaths on the roads rose, especially amongst children on their way to and from school. In 1972, a total of 3264 people were killed on Dutch roads, and at around the same time, in 1973, 450 road deaths were of children. 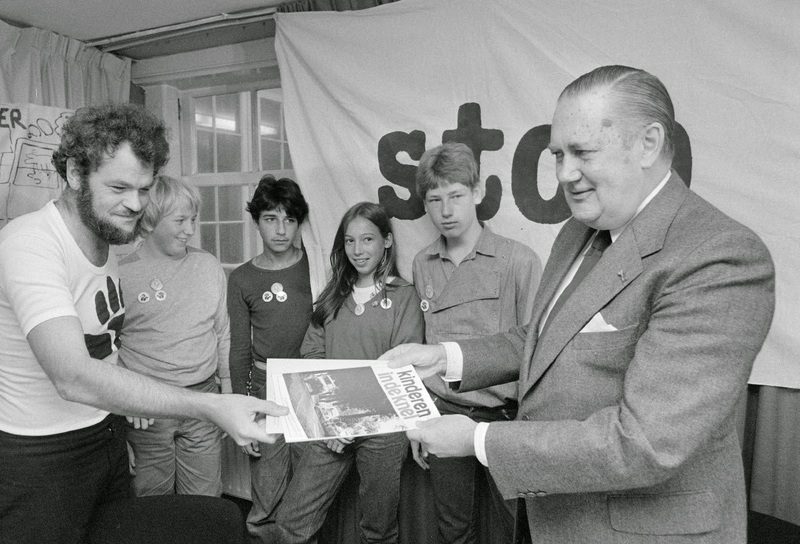 1973 was also the year that the pressure group "Stop de Kindermoord" ("Stop the Child Murder") started. The object of this group was to point out the number of deaths caused to children and to campaign to reduce them. They successfully influenced the Dutch government to re-emphasize building of segregated cycle paths, and to make money available to pay for them. This resulted in both a rise in cycling and a reduction in cyclist deaths, reversing the previous trend. It has been a success not only for child cyclists, but for all cyclists, and indeed for the population as a whole. There is a lesson here for other countries. I'll take Britain as an example. It is difficult to campaign for better conditions for "cyclists" in Britain. Cyclists are a minority group, and not a very well liked minority at that. Cyclists can be considered to be an out-group. This is a large part of why it is that cycling initiatives come and go in Britain. There's no real emphasis placed on results because too few people see it as important. When cyclists in Britain are hit by cars, they get very little sympathy from the public at large. Campaigning for child safety is different. Very different. Children are not a minority group. Most families include children, all adults used to be children. Child safety is an issue which is important to everyone and difficult to ignore. All parents want their children to be safe. It is clear that there is a problem with child safety on the roads in the UK. This is the underlying reason why it is that children are increasingly being driven to school. It is the reason why American style school buses are proposed for British kids, and even the reason why someone made the news for driving with his walking child on the school run. When British parents attack traffic wardens next to a school, they even do this in part out of concern for the safety of their own children. These are not solutions to the problem, but they are reactions to it. They demonstrate that parents are not remotely happy with the roads as they are. Campaigners often talk about there being a suppressed demand for cycling in Britain. It's true. There is. When I was a campaigner in the UK, many people would tell me that they were very keen to take up cycling, but for one reason or another. However, the suppressed demand for conditions in which children are safe on the streets is very much greater. This is what any campaigner who wants to see mass cycling return to the UK ought to be campaigning about. Get parents on your side and there will be a mass move to change infrastructure and improve conditions. I can see the responses from a certain element of the cycling community in the UK. i.e. those who are concerned about being "forced" to use sub-standard shared-use paths next to the road. However, this is all part of the problem. Sub-standard facilities are of no use to anyone. Not only are they no good for confident adults to cycle on, but they will also never provide the level of subjective safety required for British parents to think their children are safe on a bike. I've seen many examples of what happens in Britain. Planners think that if they provide a couple of hundred metres of astonishingly bad quality shared use next to a school that they've actually done something. People afterwards ask why it is that such facilities are not used. The answer is very simple: they are not usable. The quality is much too low. Tokenism isn't the answer. It's a grave mistake to think that low quality off road provision "for slow and inexperienced cyclists" is all that is needed, and that "fast cyclists" will always be better off on the road. If separate infrastructure is not good enough for a confident adult to use then it's not good enough for kids to ride to school on either. The differences between British and Dutch streets are very easy to see. They're actually almost exactly the same as the differences between Dutch streets in the 1970s and now. i.e. British streets now resemble Dutch streets 40 years ago. It's not actually all that expensive to achieve such a transition - it simply takes a consistent policy over years. Road casualties in the Netherlands have dropped steeply, even as cycling rates have risen. Now approximately 720 people per year die on Dutch roads. 180 of them are cyclists, and 22 of those are children. The cycling figures may sound high, but they are in part a reflection of the number of cycle journeys made. The Dutch now experience an overall risk which is less than a quarter of that in 1973, and for children it's now a twentieth of that in 1973. Dutch cyclists are now the safest in the world. Of course, the campaign goes on to reduce the figures. Meanwhile, British roads have become safer for drivers, but they have not achieved such good results for vulnerable road users. It would only take about fifteen years to turn this around, following which even better plans can be made. Dutch parents improved conditions on their roads so that their children were safe. The same could be done in other countries. Support the Campaign for Childhood Freedom. reduced to just 2% of the previous level. Since this blog post was written, Dutch roads have continued to get safer. In 2013, there were a total of 570 road deaths in the Netherlands, just nine of whom were under 15. Five were child cyclists, four were child pedestrians. Even one death may be seen as too many, but this is still startling progress over the peak in the early 1970s. Note that this great success in improved safety was achieved with children still cycling en-masse, and without distractions such as bicycle helmets. The improvement in safety came due to improving the infrastructure which people use. The Netherlands now has an extensive grid of high quality cycling infrastructure which covers the nation. 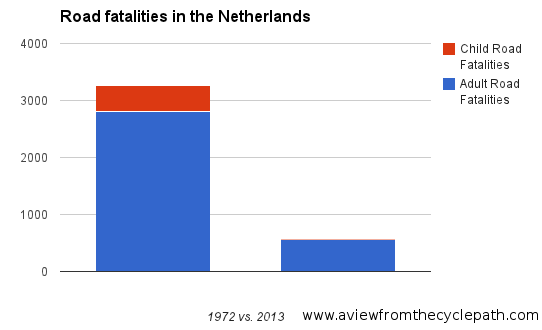 This doesn't only serve children, but all cyclists and cycling is safer in the Netherlands than in any other nation. In 1989, "Stop de Kindermoord" changed its name to "Kinderen Voorrang" ("Priority for children"). In 2001 they became part of the larger road safety campaign, 3VO / Veilig Verkeer Nederland ("Safe Traffic Netherlands") who continue to campaign for lower road deaths. The statue in the photo is "Fietsles" ("cycling lesson"), by Kees Verkade. It's in Groningen, here. Do you want to know more about the history of cycling in the Netherlands, read more stories tagged with history and the articles linked from here, particularly The Dutch Master Plan 1999. There are also many stories about school travel. Also another post referred to current work of Veilig Verkeer Nederland. I recommend also reading responses to this post by Karl McCracken, Dave Warnock and NicoleP. It's often noted that there is little government or public enthusiasm for spending even small amounts of money on the small number of people who are currently cyclists. I was discussing your answer to that with a couple of other cyclists & a transport consultant over the weekend, that it's also the potential cyclists - those who 'would' cycle - that campaigners need to consider, alongside those that already do. And the kids who can't get around by themselves, or in the case of my eldest who rides, get around easily with their parents on two wheels - cyclists in their own right, and potential non (or not very often) drivers when reaching adulthood if the conditions are right. Great post & alternative angle for campaigning - thanks. I think you're spot on, David, but I'm wondering whether we in the U.S. are too far gone. It might have been possible in 1973 to ask communities to build better infrastructure for children who still rode and walked to school. In 2011, it seems to be about twenty years too late. Parents started driving their children to school in earnest sometime in the late 1980s. It's not evident to me how we'd sell bicycle paths as a safety provision for children, when children don't ride bicycles. You mention that there is latent demand, of course, but that's tough to measure. @examinedspoke: my thoughts exactly. People in the US seem to have wholeheartedly adopted the idea that no one, and least of all children, should attempt to move about under their own power. It's very depressing. You'll remember this case, in which a mother was actually punished for accompanying her child to school by bicyle. And what is happening in the UK? Lollipop people are being sacked to save money! Children are protected from being run over by being taken to school by car. I find that how children get to school in our suburb depends on the age of the subdivision. I live in a house constructed in 1969. With the middle school less than half a mile away, most of my neighbors' kids walk or ride bikes. I've counted about 4 dozen bikes at the rack, which is optimistically good. Crossing guards are staffed at four other intersections for other schools. The cutoff for bus service around here is generally about 0.8 to 1.0 mile. Incidentally, there was an uproar when the high school raised its cutoff to 1.5 miles and used computer algorithms to cut off households, but not enough of one to result in new bike facilities or sidewalks. Another middle school was built in the early 1990s. For the last 15 years, the local township has blocked the local municipality from constructing a sidewalk or sidepath to the school, so the walk/bike rate is surely 0% for at least 600 students. However, the tax climate in this part of the country (Chicago, west suburbs) is such that the voters don't punish this sort of behavior - they re-elect those officials for saving a few tens of dollars instead of building sidewalks. So in some ways, yes, the U.S. (significant parts of it) are too far gone, and unless $10 / gallon gas rears its head (highly unlikely) I don't see things changing on a fundamental basis anytime soon. My sentiments exactly. Very well put sir. This is one of the approaches I intend to take for the new Cycling Embassy of Great Britain which has it's start up meeting in London on 29th January. There are lots of people in the UK that wish to take a different approach to cycle campaigning - in particular it's aims and strategies and the support so far gas been incredible. If you're anywhere nearby, do drop in! Rob - "unless $10 / gallon gas rears its head (highly unlikely) I don't see things changing on a fundamental basis anytime soon." I read this week that the US national debt had reached the monstrous figure of 14 trillion dollars. The change of fundamental basis may be nearer than you think. And then there isn't even money for sidewalks anymore. However we must realise that the UK government get a great deal of Tax revenue from transport fuel sales. call me a cynic but I suspect the reluctance to provide proper cycling facilities may be influenced in part by this cash cow. On another note A new Cycle lane was recently added here in cambridge out of the city and up to a local beauty spot (the Gog Magog hills) but the good quality surface teminates there when the potential to actually provide a usable through route is not continued save foe a short stretch of loose surface material which is totally unusable. While there is no doubt there are shared use facilities that are so bad they are useless to everyone. And I would agree that shared use pavements make junctions worse for the cyclists. However they feel safer to people (addressing the subjective safety issue) and most parents would probably be happy with their children going on the average shared used pavement rather than the road. So, I'm not sure I agree with "they will also never provide the level of subjective safety required for British parents to think their children are safe on a bike.". I think substandard facilities (i.e. shared use pavements) do address the subjective safety and parents don't realise the dangers they introduce. In short, while I think the child argument is a good one, I believe there is a danger of ending up with facilities that look safe for parents to allow their children on. Neil: I take your point that it might be possible to fob off parents with something not quite as good as it ought to be. However, what has been done in Britain so far has not satisfied parents that their children will be safe. This goes not only for cycling, but also for walking, on those same "shared use paths". Too often, the walking environment in Britain looks like this. If the infrastructure was doing its job, you might see walking and cycling to school as rising trends, but actually, they are falling trends. As for ending up with low quality facilities - you have to be really vigilant about this. At present in the UK, even cycle campaigners sometimes seem to boast about their cities installing infrastructure which simply isn't of a high enough standard (e.g. one example I know of: "Construction has started on the hard-won cycle lanes" - about rather inadequate narrow on-road lanes being built 20 years too late along a road which has plenty of room for something better), and the example that . It's almost like Stockholm Syndrome. Campaigns go on for so long that eventually when the most minor improvements are "won" the campaigners see this as a victory bigger than it actually is. In effect, the campaigners end up sympathizing too much with those who actually work against them. But how do we get from where we are in the UK to the Dutch standard? True many UK shared use paths let you down at junctions, but the Dutch have fixed that so why don't we copy them? BUT how do we as cycle campaigners persuade local politicians and people? Is vehicular cycling capable of geting us to a modal share that can be a jumping off point for something better? 9 year old daughter cycle on the roads. By the way, the wicker basket I bought fom you is still going strong! Cycling England and the DfT have produced some helpful publications and guidelines on cycling and the Dept for Health's 'cycle4life' campaign is well-intentioned. These are top down initiatives which create an environment but are not of themselves the catalyst for change. Change would depend on local councils having the vision, energy and commitment to promote utility cycling. The way forward is to leverage the good work done by Sustrans and Schools Sports Partnerships in schools - Bikeability training and Bike It events. If local communities can lobby their councils for safer cycling routes to schools we will see some movement by the politicians. So in answer to Oldgreybeard, I think it's about being aware of the highways engineering options and engaging with local councillors and council employees to explore what can be done, from the child safety angle. I have been talking to neighbours about safe cycle routes to our local school. There is acceptance that a blanket 20 mph limit on residential roads would be a good thing, even recognition that one way systems and partial closures would be beneficial in eliminating rat run traffic, which would make the routes to school far safer. It's early days but my own experience confirms the power of David's hypothesis. I am in Australia, a country still very much in love with their motorcars, and there is no "duty of care" legislation to protect other vulnerable road users yet - just 36 years behind in getting a pressure groups started. There was the unfortunate case of Mandatory Helmet Laws implemented in 1990 that caused a reduction of about 40% of the cyclists on the roads so it's a little understandable the cycling pressure group is still very small at this stage. I think children and primary schools are the key in the UK. Also what if parents only got sibling rights if they did not drive their first child to school…. And school catchment area were defined based on ease of none car travel, rather than distance and out of catchment children were given preference if the parents proved there were willing not to drive their children to school. When you say "road deaths", do you just mean pedestrians and cyclists, or does that include anyone involved in a motor vehicle accident (ie. the people in the car too)? Maryann: That means all road deaths, of people in cars both as drivers and passengers, and also those outside walking or cycling. TfL has no idea about cyle lanes (check http://www.amazon.co.uk/gp/product/1903070589?ie=UTF8&tag=transmanches-21&linkCode=as2&camp=1634&creative=19450&creativeASIN=1903070589 for instance. I would probably consider those who have been presented with explanations for why these excuses and explanations of road design, even one lucky mayor who got offered a free study tour (Boris Yeltsin or Boris Johnson, I know who I'd take, and I know the former was a president not mayor) and with the power and money to take care of these cyclists, pedestrians and other traffic managers just as guilty of murder as one who sits around watching a helpless child die.